Spider-Man Battery-Powered Ride-On Just $69! Down From $149! You are here: Home / Great Deals / Spider-Man Battery-Powered Ride-On Just $69! Down From $149! Right now you can get this Spider-Man Battery-Powered Ride-On for just $69 (Reg. $149) at Walmart! You can get FREE shipping or you may be able to get FREE in-store pickup! 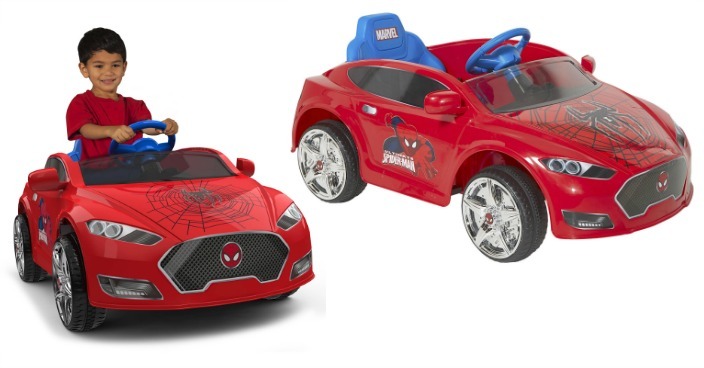 Let your little crime fighter patrol the streets in this six-volt Spider-Man Speed Coupe! Featuring lots of Spider-Man graphics, webbed details and a bright red body with “chrome” wheels, this six-volt is fit for a mini-superhero! With speeds up to 2.5 miles per hour and a working horn, your toddler will get hours of enjoyment!